Wisden Cricket Monthly has returned to the newsstand as a fresh, contemporary magazine from the most trusted name in cricket writing. Wisden’s famous yellow book, the Wisden Cricketers’ Almanack, continues to set the standard for insightful writing and comprehensive coverage of the game, and Wisden Cricket Monthly magazine will show a similar commitment to these values. 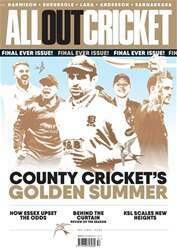 Every issue features big-name interviews and columnists, original and entertaining features and extensive coverage of international, county and club cricket, as well as coaching tips, book reviews and competitions. Subscribing to the digital version of Wisden Cricket Monthly is the cheapest and easiest way to read the very best cricket writing wherever you are! 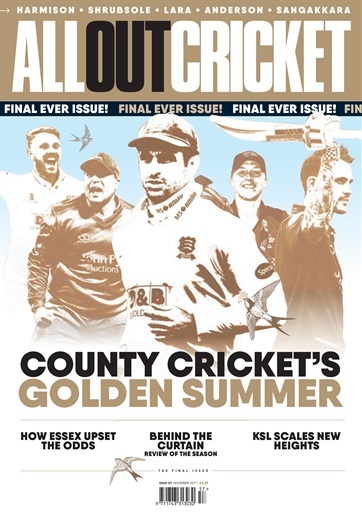 In the latest issue of All Out Cricket, out on October 5, we celebrate a golden summer of county cricket by speaking to the key men behind Essex’s against-the-odds Championship triumph, Vithushan Ehantharajah takes us behind the curtain to reveal what life is like on the county circuit and Raf Nicholson reviews the second edition of the Kia Super League. Elsewhere we pay tribute to Kumar Sangakkara with an evocative photo diary after the Sri Lankan legend signed off from first-class cricket in typically magnificent style and ex-England quick Steve Harmison explains the difficulties he had to overcome in his career in a candid interview. Wisden’s famous yellow book, the Wisden Cricketers’ Almanack, continues to set the standard for insightful writing and comprehensive coverage of the game, and Wisden Cricket Monthly will show a similar commitment to covering, analysing and celebrating the game in all its forms. Every issue features big-name interviews and columnists, original and entertaining features, and extensive coverage of international, county and club cricket, as well as coaching tips, book reviews and competitions. The magazine is edited by Phil Walker and Jo Harman, both formerly of All Out Cricket, supported by editor-at-large, John Stern, and an editorial board of journalists, broadcasters and former players including David 'Bumble' Lloyd' and Almanack editor Lawrence Booth. Subscribing to the digital version of Wisden Cricket Monthly is the cheapest and easiest way to read the very best cricket writing wherever you are. You'll receive 12 issues during a 1 year Wisden Cricket Monthly magazine subscription. You'll receive 12 issues during a 1 year Wisden Cricket Monthly magazine print subscription.